We’ve known that the new 2019 Ram 1500 pickup truck, called the “DT” platform, will get some significant design changes. But now we have a lot more info on what’s under the refreshed sheetmetal. Fiat Chrysler’s revised half-ton truck does boast some big new capability claims, including a massive 2,300 pound payload max and huge top towing capacity of 12,750 pounds in certain configurations. 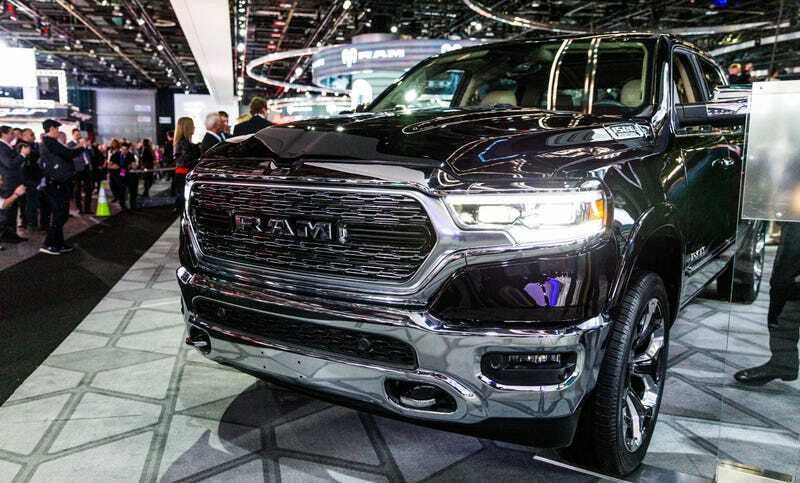 Barring surprises from any other automakers, Ram will be the only outfit utilizing a mild hybrid system on updated versions of its 3.6 liter V6 Pentastar and 5.7 liter V8 Hemi engines. The gas V6 will be rated to 305 horsepower and 269 pound-feet of torque, just like the current truck, but the hybrid power boost is supposed to add 90 lb-ft of torque when it comes online. The Hemi V8 has the same baseline power figures it does now too: 395 HP and 410 lb-ft, with the hybrid system adding 130 lb-ft. The 2019 Ram with those engines is supposed to arrive at dealers as soon as the first quarter of this year, but there doesn’t seem to be any word yet on the status of the 3.0 EcoDiesel. The hybrid system is used in both the V6 and V8, as is an eight-speed automatic. It will be standard on the V6 but optional on the V8. That system probably works like the Motor Generator Unit in the 2018 Wrangler, which FCA calls “eTorque,” which basically provides the truck with a boost by feeding power from a 48 volt battery to the powertrain through the engine’s drive belts. The MGU is installed where an alternator would typically be, acting to both utilize the vehicle’s battery for propulsion and feed power back into it during regenerative braking. In theory, the practical benefits of such a system would be improved fuel economy and seamless start/stop events when the truck shuts itself down at a stoplight. There’s still a regular separate starter motor that will crank the truck to life during cold starts, but the MGU will be what turns the truck back on when it automatically shuts off under normal operation. We’ll find out more about how it works and how it feels in the coming days and months, when we eventually get to drive this thing. Actual mpg claims are TBA for now. Beyond the mild hybrid system, the 2019 Ram’s more interesting features include an enormous 12-inch portrait-oriented center console display. The screen is big enough to rival Tesla’s, with the row slick and classic looking switch style hard keys. Some more cool looking controls are mounted near the rear-view mirror at the top-center of the windshield, creating a very futuristic vibe in the cab. I love how cleanly that monolithic monitor is integrated into the dashboard. The toggle switches look great, too. And the rotary shifter, even if you hate it, does free up a lot of storage room in the center console. Additionally, the new Ram will have an optional power tailgate, meaning that you can open it with the push of a button. Sadly for Chevy, the 2019 Silverado was only the “exclusive” power-tailgate half-ton truck for a few days. That tailgate, along with the truck’s hood, will be made of aluminum. That, plus changes to the frame, are supposed to account for a total weight savings of up to 225 pounds off the current “DS” platform Ram. If you’re hot for weight savings, you might not want to spec the panoramic sunroof, but, yeah, a massive roof window like the one Ford introduced on the 2015 F-150 is optional on the new Ram. The Ram 1500’s range of trim levels will be edited from 11 to eight for 2019: the standard basic Tradesman work truck, an HFE fuel economy focused model, the Rebel off-road trim, and the Laramie, Long Horn, Big Horn and Limited lux trim. The full four-door crew cab version of the truck is 3.9 inches longer than the current vehicle, with an extra 4.1 inches in its wheelbase. That’s supposed to translate to more rear passenger legroom. There’s still going to be a lot of measuring to do to see how this thing really stacks up to its rivals, but the interior might be my new favorite truck cab cockpit. I’m really looking forward to sitting in one of these, driving it, and seeing how it really handles more than a metric ton of junk in the bed.